Select your unity sand ceremony set. 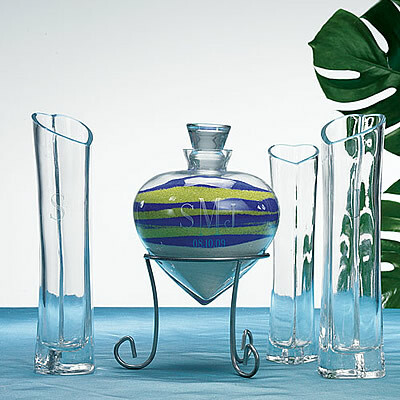 This traditionally consists of three vases, two small and one larger vase. 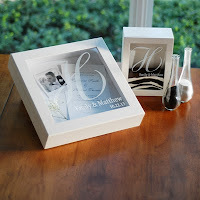 However, beautiful sets are now available that include personalized frames or keepsake boxes in place of the larger vase. These can make cherished family heirlooms. 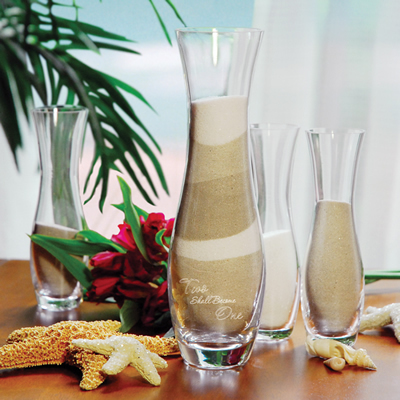 At the wedding, display your set at the front of your ceremony location and place one color of sand into one vase and a second color into another vase. Each is designed to represent the Bride and Groom. At the appropriate point in the service (your officiate will lead the ceremony), the Groom pours a portion of his sand into the large vase or vessel. The Bride then pours a portion of her sand in on top of the Groom’s in the large vessel. To conclude, the Bride and the Groom jointly pour the remaining sand from each of their respective vases into the large vessel. The commingling of the colored sand is a romantic symbol of two becoming one, and concludes the unity sand ceremony. When children are involved, simply add additional colors of sand and incorporate the children in the Sand Ceremony. This is a safe and meaningful way to symbolize a new blended family. Your Chaplain or Officiate should have a variety of unity sand ceremony readings for you to select from, or you can be creative and craft your own. A simply Google search on the web will reveal readings for just about every life situation. The important thing is that your unity ceremony reflect you personally, as a couple, or as family if you will be doing a blended family ceremony. 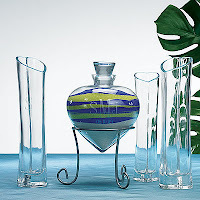 If budget is a considerable issue, consider purchasing 3 vases at a local discount store. You just need one of the vases to be larger than the other two. You can actually purchase personalized (and beautiful) unity sand ceremony sets for under $100 online. The nice thing about going this route is that you have an heirloom quality piece after the wedding that you will enjoy and cherish for many years to come. Most unity sand ceremony sets are sold with the pouring vessels included, but be sure to check. Sand is typically sold separately. The amount of sand you need will depend on the size of the unity sand ceremony set you are using. Unity sand is generally sold in 1 pound bags. A 1 pound bag equates to approximately 1.5 cups of sand (or 12 ounces). When purchasing your unity sand ceremony set, be sure to review how many ounces each vessels holds. You can then determine how much sand to purchase for your set. Keep in mind, you do not need to fill the vessels completely. If you are planning a unity sand ceremony for your wedding, be sure to checkout WhereBridesGo.com! 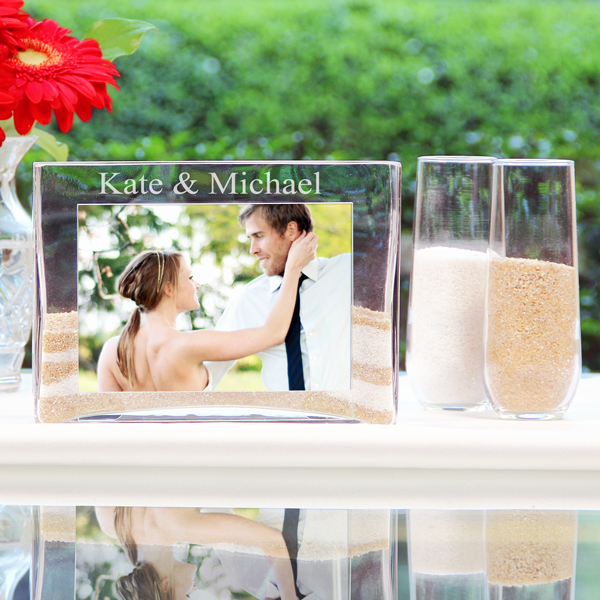 We have a great selection of personalized unity sand ceremony sets, plus a colorful selection of unity sand to perfectly coordinate with your wedding palette. Where brides go® ... for what brides love! For a great selection of affordable bridesmaid gifts,wedding accessories, and wedding cake tops, check out WhereBridesGo.com!